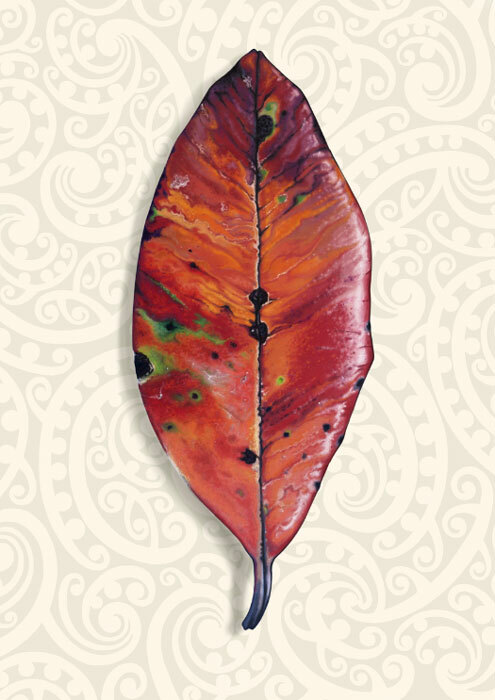 I love those dead leaves laying around like jewels under Pohutukawa trees at the beach or park. Each one a different message of chance, change and passing on... Obituaries to one leaf from a tree of many where it helped grow the whole. Aren't we all like that, each a part of the society we help to make? This leaf, this New Zealand icon represents to me the one that could not have lived but for the many. Each of us might have this history of damage, disease, life and death etched on us as we lay still and silent after the race of life. I place it here, hovering over a field of kowhaiwhai which references Theo Scoon's artworks of the 1950s. Theo was an immigrant from Eastern Europe who as left me with one of my most basic references of Aotearoa. His patternation is my sky, my forest and my sea and even my paisley. Passing on, we must all move through this place and this leaf represents the trials but also the beauty of that process. Era i roto te rangimarie.